Can you tell that our challenge was to use orange? It's isn't a color I use often, but I am now wondering WHY!! What a great color! I am working on a digital book showcasing all the fun we had on our recent beach vacation in Galveston. This will be the cover page....six little boys, six parents and one grandma. What a great time we had!! Be sure to click right here to see what all the designers are sharing today. And you can play along with this week's challenge too! 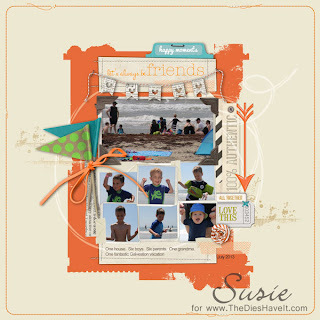 Get your orange on and add your creation to the site. What a fun way to start the week!